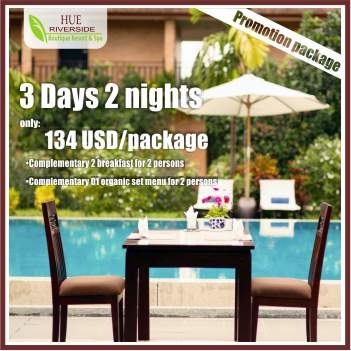 Stay 02 nights Get Offer - Complimentary 1 Meal with Organic Menu for 02 people. Our gourmet food is prepared fresh daily, We use only certified organic ingredients with the exception of some of our spices which come from local Dong Ba market, the highest quality spices in whole foods markets. - Complimentary using of WIFI, swimming pool, kid club, game room, gym room. - Complimentary daily fruits at room.